My favorite medium has always been black ink on paper (known commonly as Pen & Ink). I try to instill life and passion into everything I create. As far as I'm concerned, the characters are real people with real emotions, the architecture was built by living, breathing people, and the artifacts were lovingly and carefully made by crafts people for sale and use. A lot can be stated with black lines on white paper. Crusader foot soldier, 1099 AD. 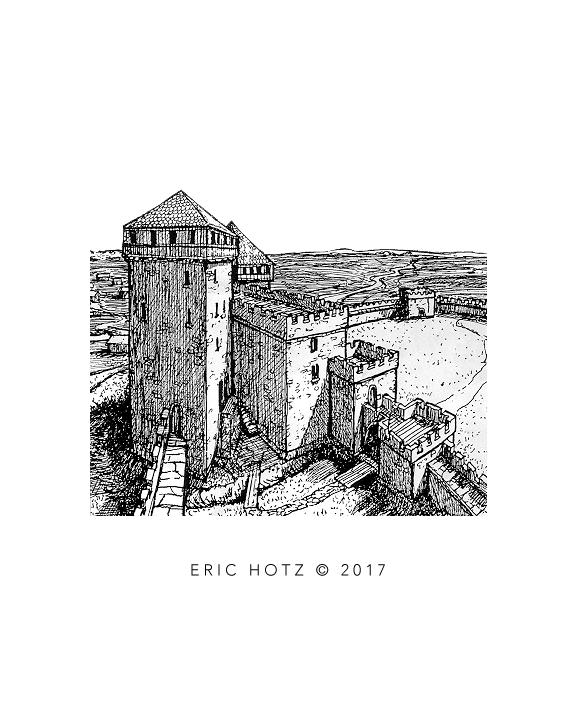 This piece, along with several other illustrations were commissioned by a book/game publisher for their RPG (role playing book). This was just one commission of many that I received from this publisher over a 10 year period. This soldier is neither a Templar nor a Hospitaller. The Templars formed in 1119 AD and the Hospitallers were not a fighting order until after 1099 AD. This man would have been a typical foot soldier. 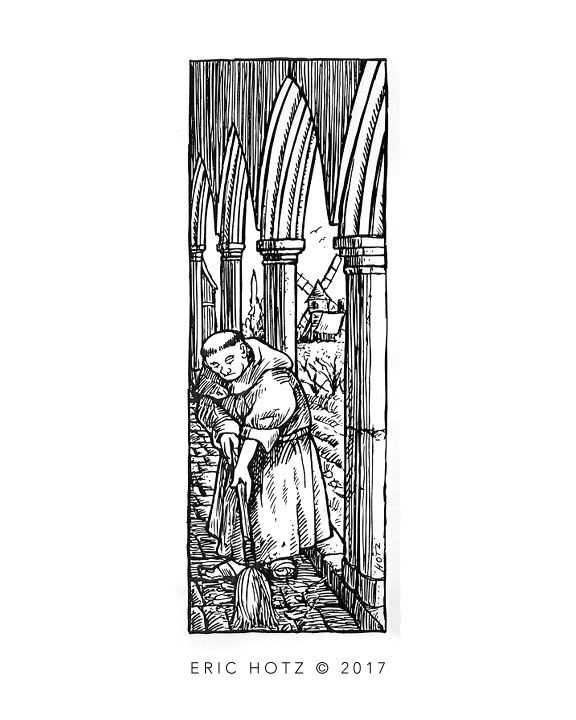 ​depicting medieval life and I was given artistic freedom to create a few illustrations within this commission to show everyday monastic life. This is one piece I created. 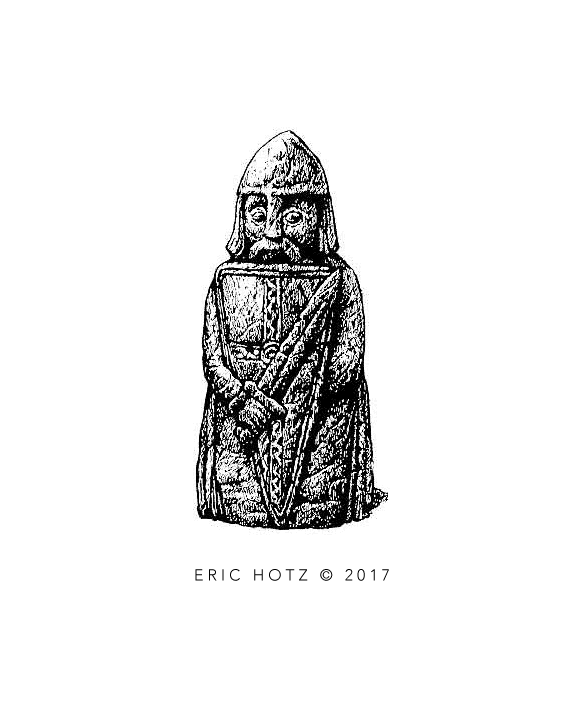 Artifact Illustration. Having worked as a field artist on several archaeological sites, creating artifact illustration comes easy. This illustration is just one of several small illustrations I have been commissioned to create over the years. In this case, the publisher needed several small illustrations depicting medieval artifacts to fit various spots through the book. 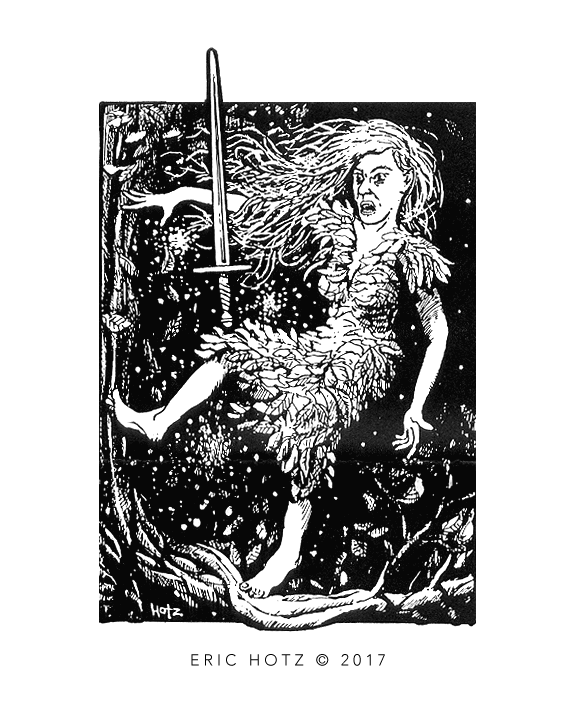 This illustration was published in a book about fairies. The title of the piece was, "Fairies and Steel", and follows the old world story that fairies cannot touch man-made metal objects. 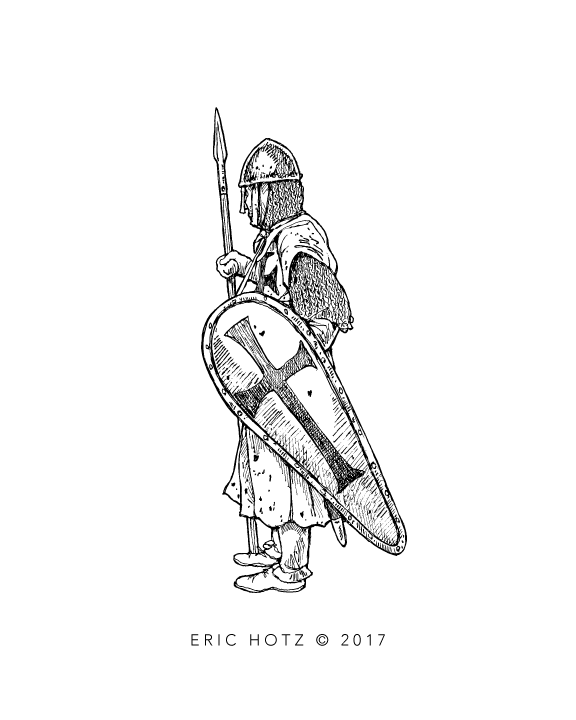 Medieval Warriors: I was commissioned by a publisher to create 6 medieval warrior illustrations in pen & ink measuring 9 inches tall before reduction to fit the spot on the pages. Each illustration took 6 hours to create and I had to refill my technical pens twice per illustration -- I used three different tech pens to render these illustrations. These were a fun commission. 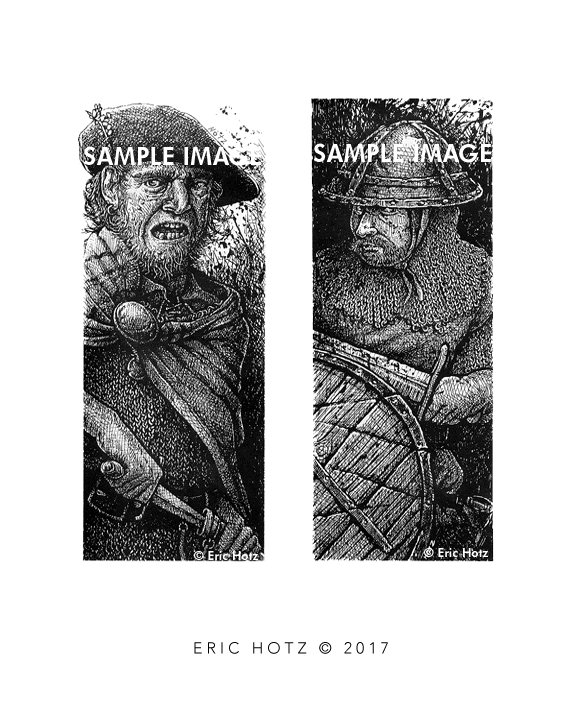 Later I was asked to illustrate 2 more pieces similar for a different book by the same publisher. 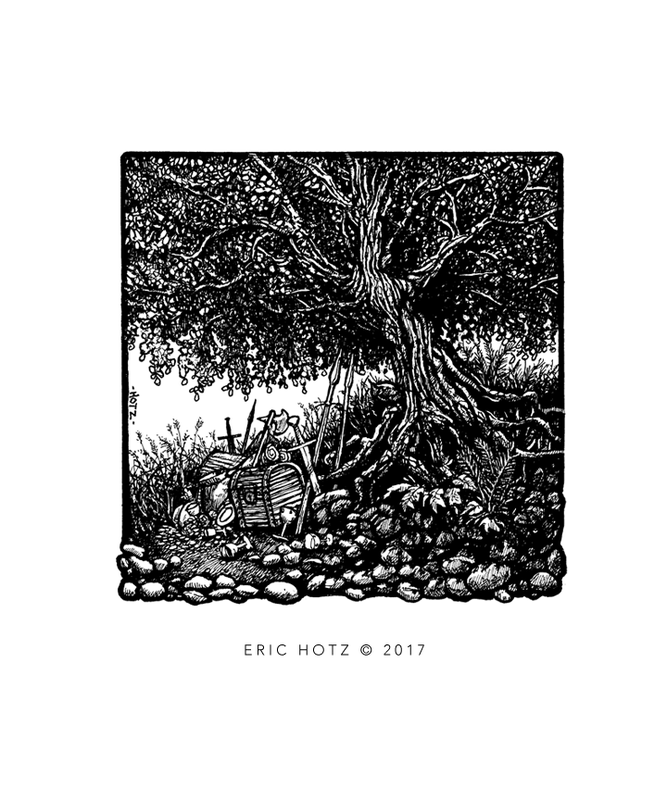 The Treasure Tree. 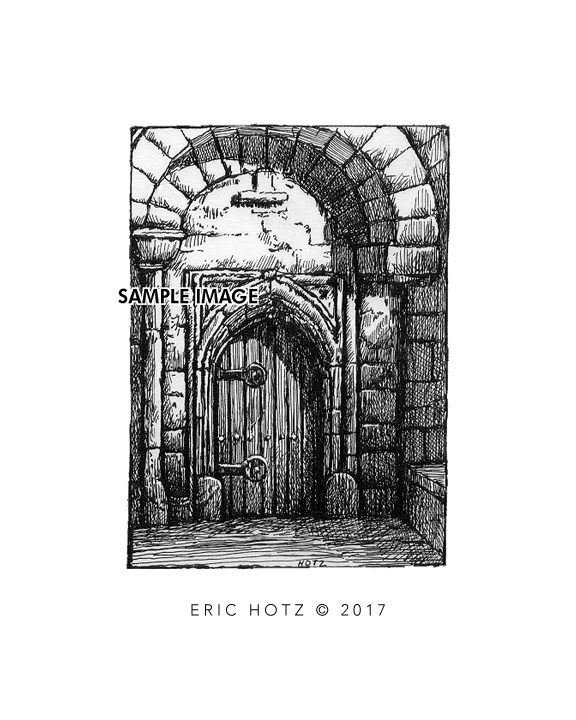 This illustration was part of a large commission I received with the only instructions given, other than the final artwork sizes required, "That the artwork convey a medieval atmosphere". The publisher came back to me with a lot more work soon after. I ended up working for this book publisher for over five years. Having worked as an archaeologist, as an excavator and a archaeological field artist, I developed an appreciation for old handmade objects. I find medieval doors to be particularly fascinating simply because of the crudeness of their construction, and because they still functional as originally designed. Someone knew what they were doing when they designed this door . 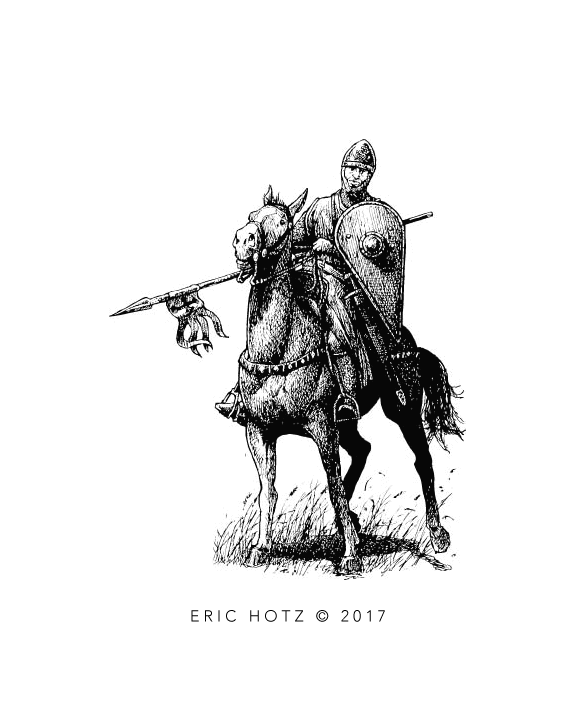 The backbone of any medieval European army was the cavalry. These were the knights of folklore, the heavies that were relied upon to quickly crush their opponents in open combat. Most medieval horses were a lot smaller compared with what you see in the movies and in popular TV shows today. Medieval castles. I illustrated many such structures over the last few years. I also made floor plans for such structures to go along with these illustrations. This illustration took a bit of research to make sure what I was depicting was historically correct. For one publisher, I was in charge of editing other freelancer's work, making sure their building floor plans were architecturally. The medieval church. Its surprising that many medieval churches were made from the stone blocks taken from ancient Roman ruins -- its cheaper to reuse stones than to cut new stones. Many of these churches exist throughout Europe, found along old pilgrimage trails, tucked away in remote areas, but never really forgotten. 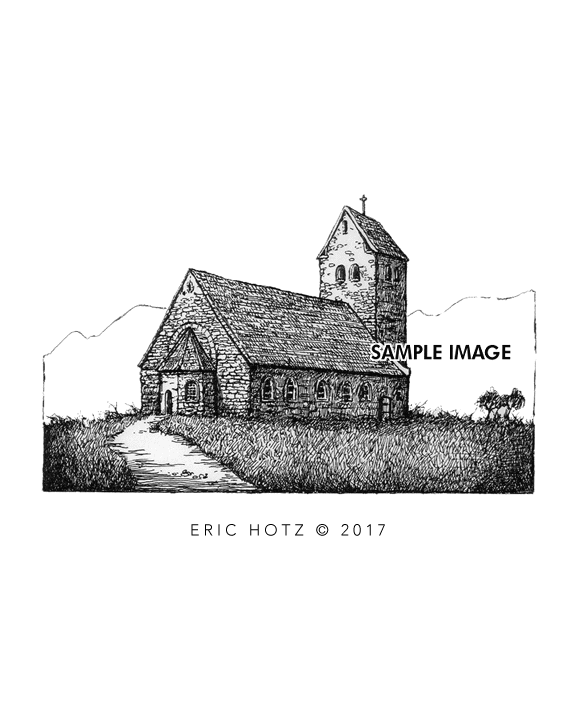 However, what is more surprising is how many medieval churches I have been asked to illustrate over the years.